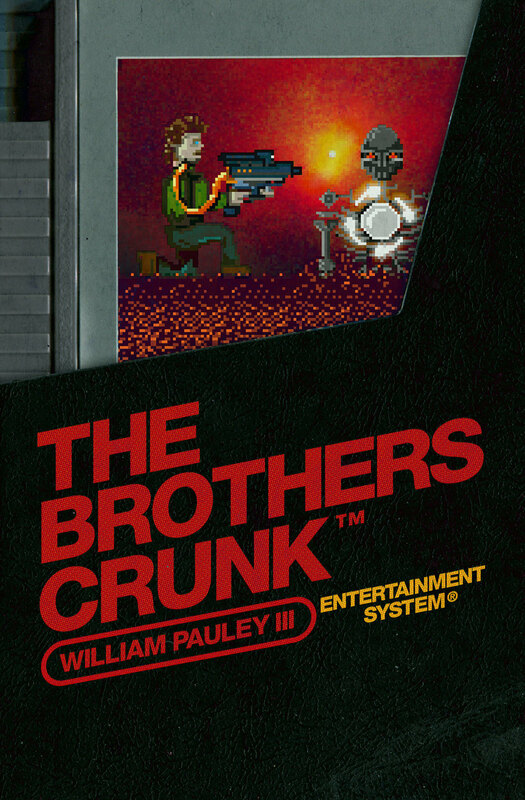 Book cover design for The Brothers Crunk by William Pauley III. Brothers Divey and Reynold Crunk are two traveling breakfast burrito salesman just trying to make a living in the post-apocalyptic world of Planet Japan. After discovering a mutilated robot corpse in the middle of the desert, Divey mysteriously transforms into something abominable, setting a bizarre series of events into motion. Reynold follows his brother into the dark underworld of Tokyo, where there are no rules and old video game accessories are used as real weapons. THE BROTHERS CRUNK is an 8-bit fack-it-all adventure in 2D. Please consult a doctor if you experience any of the following symptoms while reading: convulsions, eye or muscle twitching, altered vision, involuntary movements, disorientation, or loss of awareness.